The Boys of Bedford, Va.
by John Coleat11:00 pm on June 3, 2004 . It has 13 Comments. This is my contribution to the MilBlogs And Friends Special Edition of the Sixtieth Anniversary of D-Day, organized by BlackFive and Greyhawk of the Mudville Gazette. Maybe it is because I grew up in a small town of 350 people, and I understand a little about the dynamics of the social fabric in small communities, but one story that has always stood out to me among all of the tales of heroism on D-Day, June 6th, 1944, is the extreme sacrifice made by a small community near the Blue Ridge Mountains. This is my tribute to the men of Bedford, VA (as well as all who fought in WWII and on D-Day), and while not as thorough and intricate as the work done by Alex Kershaw in his wonderful book The Bedford Boys, perhaps I can do my small part to help keep their story alive. In my small town of Bethany, WV, my next door neighbor was the mother of the Postmaster; her other sons ran the town’s General Store. My other neighbor was the father of the Fire Chief. My dad was mayor, my good friend’s dad was the town minister, all of my friend’s fathers were either our baseball or soccer coaches, our Cub Scout and Boy scout leaders, the elders in the church, members of the town council, volunteer firemen, or some other vital part of the intricate patchwork that holds together small communities. The same can most likely be said about the town of Bedford, VA, and this should help to illustrate how much they sacrificed on D-Day. 9 battleships, 23 cruisers, 104 destroyers, and 71 large landing craft of various descriptions as well as troop transports, mine sweepers, and merchantmen-in all, nearly 5,000 ships of every type, the largest armada ever assembled. Huddling together seasick on one of those ships were 33 men, volunteers, from the community of Bedford, VA (population 3400), all members of A Company, 116th Regiment, 29th Division. The Overlord plan for Omaha was elaborate and precise. it had the 116th Regiment of the 29th Division (attached to the 1st division for this day only) going in on the right (west), supported by C Company of the 2nd ranger Batallion. The 16th Regiment of the 1st division would go in on the left. This detailed map shows the over-all plans for all the beaches, while this smaller map lists the exact breakdown for Omaha Beach. The men of the 116th were responsible for Dog Green through Easy Green, tied in to the 16th Regiment, 1st Division on their left (to the east) and on their right (to the west) by C Company of the 2nd Ranger Battalion (made famous by the film Saving Private Ryan). Unfortunately for the men of Company A, 116th- they were the only ones to land when they were supposed where they were supposed to, and this led to almost total devastation. 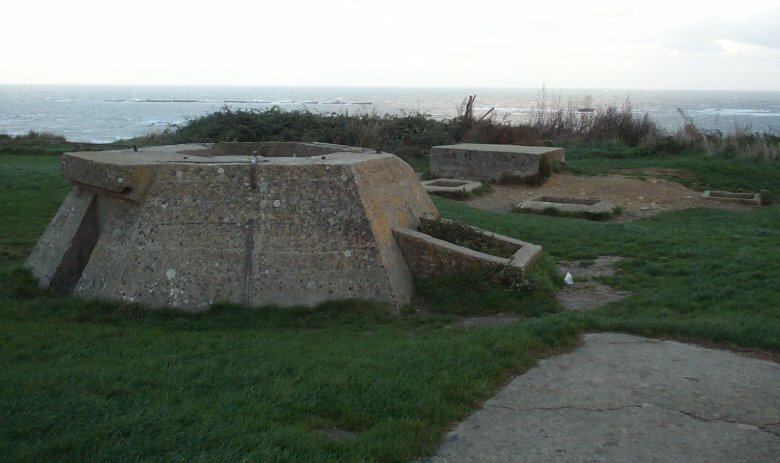 This pillbox/gun emplacement was at the far west of Dog Green, placed at an oblique angle to rake across the beach, rather than facing directly at sea. It helps to display both the type of overlapping fire the men faced, as well as the difficulty of the terrain. Trenches and firing positions connect hardened pillboxes and concrete bunkers atop the bluffs at Omaha Beach, providing excellent fields of ire for German defenders. While the men of Company A had been told that there would be tanks to support them, craters on the beaches created by preparatory naval and air bombardment to help provide cover, none of this was to be true. Anti-aircraft fire had made the allied bombing runs inaccurate, landing well within land and not on the beach as needed, the naval bombardments had likewise failed to ‘soften’ the beach. Instead, the men were greeted with a beach as flat as a pancake, littered with anti-landing craft obstacles, to add to the chaos created by the extremely choppy seas, the accompanying sea-sickness, and the anti-sea-sickness pills which served to do nothing but sedate the men. The men had been promised that they would have cover and covering fire provided by “DD tank,” amphibious Sherman tanks (a great picture of a one of “Hobart’s Funnies” can be seen here, as well as a description of the funnies and a great diagram here). Unfortunately, a separate tragedy befell those brave armor crewman, as choppy waters in the channel sank all but 2 of the 29 tanks that were supposed to land prior to and with the men of the 116th. As this landing diagram notes, the entire Co. B, of the 743 Tank Battalion, with her entire contingent of 16 Shermans were supposed to hit the beach at H-5, or 6:25 am. To add to Company A’s misery, there was also an ‘unscheduled gap’ in the assault. IN real terms, this means that while Company A was tied in on their right (to the west) by the Rangers, Company G had not landed in the appropriate sector, leaving Company A exposed to their east. The German defenders had only one mission at this point- to handle the men of A Company. There is really no need to go into the graphic details of what happened next, except it should be understood that the entire First Wave had little chance. By 6:40 AM, Company A was essentially non-existent, with all of but one of her officers killed. Deadly machine gun fire raked the ranks of the LCA’s as they put their ramps down, and the lead LCA of Company A, LCA 1015, was vaporized by either artillery, a mine, or an 88-Millimeter Gun. In one LCA, all 30 men of an assault team were killed without ever exiting the boat; later reports state that the men in other LCA’s heard the machine gun fire hitting the ramp prior to being lowered. The German small-arms fire and overlapping coverage was brutally accurate. These famous Robert Capa pictures are actually of the men of the 16th Regiment, 1st Division at Easy Red or Fox Green, but serves to illustrate the conditions facing the men of Company A. The company commander was Captain Taylor N. Fellers and the exec was Lieutenant Ray Nance. Lieutenant Anderson headed up our 30-man boat team, and each boat team had riflemen, wire cutters, bangalore torpedo men, and flamethrower people. I was with flames–the assistant flamethrower. There were also demolition men, to blow the pillboxes. My job was to follow the flame gunner, Sergeant Greenstreet, and when his flame tank ran empty, I’d switch on a fresh five-gallon drum. I didn’t see anybody from our company, so Gil and I got back into the water and went out to a knocked-out DUKW. Gil was wounded so I told him to stay until a boat picked him up. I started to swim ashore and a boat picked me up around 10:30. I finally joined up with what was left of A Company. There were only eight of us left for duty. went in with B Company, which actually was 19 minutes after A Company. I was the first one off. It was a division order that an officer be the first man to go off the boat. When it touched the bottom our coxswain brought us in right precisely where he was supposed to, and he was in front of that ramp in a steel compartment, and he pulled the latch release and the ramp didn’t go down. I said, “Get it down,” and he yanked it a couple more times, and it dropped and then I pushed and made two steps on that ramp and jumped as far as I could into the water. The water was first up to my chest and then a wave came and put it up to my neck, and I walked in and went up on the beach about 15 to 20 yards. My boat was the company headquarters boat and it was in with B Company–17 of us on that boat. Four men from the 29th Recon were behind one of those steel jack things and I yelled for them to scatter out, and no sooner than I said that, a mortar round came in and killed three of them and wounded the other. I saw Lieutenant Winkler of B Company; he was on my right and they were going down just like hay dropping before the scythe, just mown down, and Winkler was killed. Of our six assault boat sections, mine was the seventh; we lost number 5 at sea. Another one, number 2, with Captain Bellegin on it–there were 32 men on; not one single person is known to have survived. It could have exploded with all the demolitions onboard, too. So we lost the number 5 and number 2 boats out of the six boats of Company A. Of those men killed on Omaha Beach in the opening waves of the D-Day invasion, 19 men were citizens of Bedford. At about that same time back in Bedford, a 21-year-old telegraph operator was arriving for work. “I put the machine on — the teletype machine — and I said to Roanoke ‘Good Morning, go-ahead, this is Bedford’ and the operator teletyped back to me ‘I have casualties’,” Elizabeth Teass, 77 and now retired, said. Over the next few days, townspeople learned that 19 Bedford men had died in the invasion, two more in the fighting that followed. One family was hit harder than the rest. “We were the only family in Bedford that lost two sons on D-day,” Lucille Hoback Bogess, a former county supervisor, said. Bogess was 15 when her family learned that her brother Bedford had been killed. A few days later, a second telegram – her brother Raymond was missing. His body was never found, but his Bible was. It was returned to the family with a letter from the young soldier who found it. “While walking along the beach D-Day plus one, I came upon the Bible. As most any person would do, I picked it up from the sands to keep it from being destroyed,” Bogess read from the letter she has kept for 56 years. That Bible and a few mementos are all that remain now to represent the lives of her two brothers. Bogess wonders how life might have been different if the young Bedford men killed on D-Day had returned. “When you take 19 young men out of a community like this it leaves a vacuum that I just don’t think we’ve filled,” she said. Other Bedford residents would join the list later on in the European campaign. Dedicated on June 6th, 2001, in Bedford, Va, today the National D-Day Memorial stands as a token of our appreciation to the men, women and children of Bedford, and to all who lost their lives on D-Day, June 6th. More pictures of the Memorial can here. Several thousand miles across the Atlantic Ocean in Colleville-sur Mer, France, overlooking a cliff above Omaha Beach, 21 men from Bedford rest in eternal glory in the World War II Normandy American Cemetery and Memorial. Resting alongside the “Bedford Boys” in pristine rows of white crosses are 9,365 of their fallen comrades and a memorial to 1,557 missing Americans. This post is in Military. https://www.balloon-juice.com/wp-content/uploads/2015/11/balloon_juice_header_logo_grey.jpg 0 0 John Cole https://www.balloon-juice.com/wp-content/uploads/2015/11/balloon_juice_header_logo_grey.jpg John Cole2004-06-03 23:00:052004-06-03 23:00:05The Boys of Bedford, Va.
Might want to change the “.88”. The 88’s were 88mm. An “.88″(880mm) would be bigger than the Gustav/Dora. Sorry for nitpicking a great post. NO nitpicking here. Your finest work, John. This is a brilliantly composed and moving story about the horrors of war and the real stuff of bravery. Thank you, and thanks to the Boys from Bedford. those brave men stopt the war, and made me live, in a free country!!!! thank them and there familie. Great “but sad” story of the boys from Bedford. I had 3 uncles in Normandy and I was there again for the 60th anniversary. If you go to http://www.ww2dday.com and click on D-Day+60Years, you can see some of the photos. Patrick Elie of http://www.6juin1944.com also has many more. of WWII, John Cole paints an astonishing and moving portrait of the loss endured by one small Virginia town 60 years ago.